Cullera and the surprising abundance of life. In the Valencian sandy coasts it`s possible sometimes to find amazing dives with abundance of life like “Las Corvas” from Cullera. The common feature of Valencian coast is the continued presence of sand substrate that is sometimes sprinkled with rock formations or stones that are normally not higher than three or four meters over the ground. However, these rock formations function as oases in the desert, they concentrate a large amount of minor species who find in them their shelters and also some predators that are attracted by their presence. We need to have a boat in order to access the Las Corvas dive site which is located about two nautical miles away from the coast. In Las Corvas dive we descend to a rocky bottom at about 19-20 meters depth over which we can navigate until we find the sandy bottom and then we start to surround the rock platform which has an irregular shape and may have some 60 meters in diameter. In the sand area we can see pen shells and perhaps can be possible to encounter with a sting ray, while in the innumerable cracks and crevices of the rock formation we can see lobsters, sea basses and even some moray eels. We can see the presence of white gorgonians and if we look in detail will find some colorful and beautiful nudibranchs. Because it`s a flat bottom and at a significant depth the accumulation of nitrogen and the air consumption is high, so in about 40 minutes we will slowly ascent to the boat, making a safety stop and ending this interesting and amazing dive. 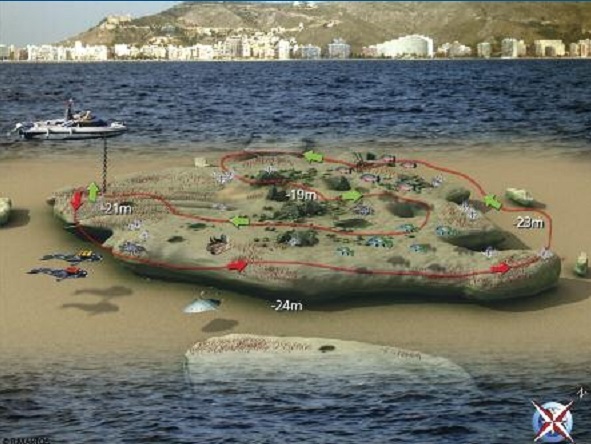 Las Corvas ( Cullera) amazing dive site is located at only 45 kilometers distance from Valencia city.